The Meteors: Get yourself a limited Deluxe Figurine Edition DVD Box!! 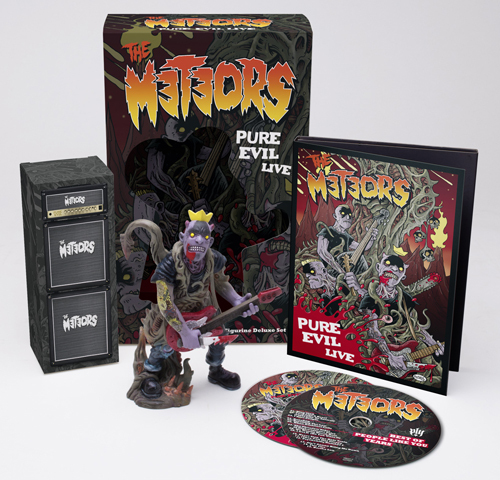 The new THE METEORS DVD “Pure Evil Live” is coming out October 31st! On the DVD you will find a whole lot of behind-the-scenes material, an entire live show from this year’s Rock’n’Ink, an interview with the band, rare videos of gigs in Spain in 1995 and Brazil in 2005 plus a best-of selection of THE METEORS video clips from the 80s until today! If this crazy packed DVD isn’t yet enough for your Psychobilly heart, then you should probably get one of the 2000 limited Deluxe Figurine Edition DVD boxes that come with a large booklet that has unreleased pictures and other stuff in it, the DVD of course, a best-of CD with THE METEORS songs that came out on People Like You Records , and a 19 cm P. PAUL FENECH figurine that has a guitar and a removable knife!! !